A little satire about an all too common scene, on any given day, in any fast food chain restaurant in America. I admit, I’ll hit the drive thru at Mc’D’s twice a month when I’m running late or too exhausted to cook dinner. But people, FAST FOOD is NOT A DIET. I’d imagine with the fat content in most fast food, that if you must chow down on a burger once in a while, it should be the food you’ve set aside as your ‘cheat’ reward, as a means of staying on a diet of fresh, raw, and wholesome foods. Having said that, I know no one’s perfect (least of all yours truly), but this new Year we should endeavor to be better than before. Put down the donuts…walk away from the waffles…and just say No to the nonsense. Cheer up, it’s only a cartoon! Inspiration: Going to a fast food restaurant (rarely) the scene and the people never seem to change. 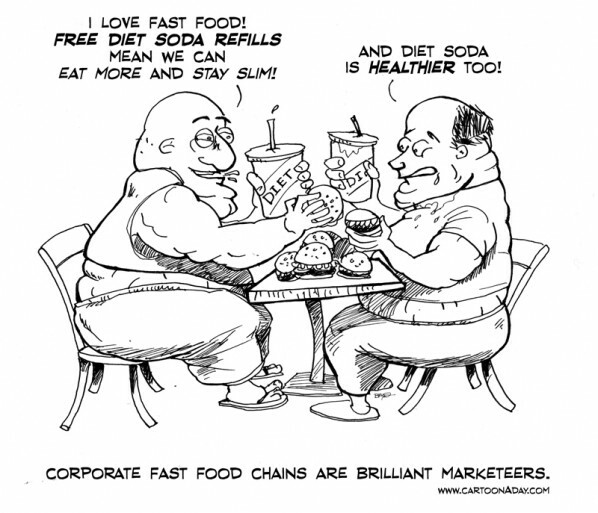 Fast food is the culprit.